This conventional minigran. NK Spring and Summer lawn fertiliser has high nitrogen levels for top growth and recovery. A slow release micro-granular fertiliser with high Potassium to help harden cell walls within the plant in stressful summer and autumn conditions. Controlled nitrogen release minimizes growth surges. With low application rates and lasts for approximately 12 weeks. A phosphorus free micro-granular slow release fertiliser based on seaweed with balanced multi-phased Nitrogen and Potassium release with added magnesium, iron and trace elements. Ideal for a spring start feed or for recovery following renovation works. With low application rates and lasts for approximately 12 weeks. A traditional powdered lawn tonic featuring low nitrogen and high potassium levels supported by 4% Fe. This unique organic based granular fertiliser outfield formulation also has a full range of trace elements producing great lawn results which can last 12 weeks. This microgran. Spring starter is ideal for the first lawn application of the year. 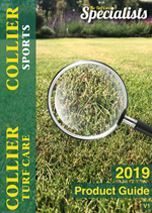 When you purchase granular lawn fertilisers from Collier Turf Care you can be assured that you are receiving not only a premium granular lawn fertiliser, but that you are buying from a company with years of experience in the industry, backed up by technical understanding and a team of professionals to assist you if needed. At Collier Turf Care we can provide you with granular lawn fertiliser and lawn sand for spring, summer, autumn and winter. For more information on different types of Granular Lawn Fertilisers and how to apply them to your lawn, visit the Feed Your Lawn - Lawn Fertiliser page under Technical Support. Apply the granular fertiliser to dry foliage and irrigate after 1 - 2 days if no rain has fallen. Irrigation will aid dispersion of the granular fertiliser which will minimise the risk of mower pick-up on close mown lawn surfaces. Avoid applying your granular fertiliser to your lawn or turf during frosty or drought conditions. Watering in after application will minimise lawn or turf foot-printing risk. If you split one of your granular fertilisers on paving slabs, concrete, clothes etc. brush off immediately, as product may cause discolouration. Delay verti-cutting and/or grooming of your lawn for 3 days after application to allow the fertiliser to disperse. Why Choose Us For Your Fertiliser? Check out our complete range of our Prestige own-brand granular fertiliser products ( including lawn sand ) below.